It's been quite a week. Dominic Berry came to see me at the museum on Friday. Dominic's a talented and experienced writer of poetry for children and I've asked him to mentor me on this project. You should check out his webpage. Earlier in the week we'd both been to see http://louisethepoet.co.uk/'s show The Sleepover at Z Arts. It was great. Lots of chewy rhymes, physical theatre and humour. It really got me thinking. Especially I started to think about making Hermes the star of the show. I started off thinking of making a big Hermes doll complete with gold sandals, winged helmet, staff and before I knew what was happening I was online shopping for gold sandals for me. I think I'm going to be Hermes. (Dominic's quite excited by the whole gender switching thing as well as the vegan carrot cake in the cafe!). Dominic's encouraged me to stick to four key poems within the Hermes narrative. I was all set to write twelve, and I still might, but only 4 will be central to the show. The others can be imported if required. We thought they should represent a journey in time. 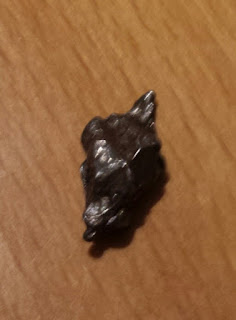 I was already keen on writing about the meteoroite (Oooh, yes, I bought a meteorite from ebay. It's only as large as my thumb nail but I keep touching it and thinking "That's come from outer space!" and "That might be older than the earth!") and the tree frog. The tree frog's interesting because not only is it that strange transition between land and see (and Hermes loves those boundaries) but because there's another story, about how we've impacted the world around us without even thinking about it (Palm oil, folks!). We talked about also having a human story - just yet I'm not sure what that is, and also a story of a future. I checked in my notebook and noticed that according to Aesop (who argues with Aesop!) Hermes was the ruler of the gate of prophetic dreams which fits beautifully. We also went down to the dinosaurs to have a look round. Dominic's working on a work for children around Dinosaurs. I thought he should have a land, air and water dinosaur, but it turns out the air and water reptiles aren't actually dinosaurs. Which is a shame because they're cool. Actually it was mostly nautilus that charmed me. Guess I'm going to have to write about nautilus myself!